Camping lets you enjoy the great outdoors, without requiring you to be shackled to the technology that pervades our everyday lives. But when there are so many cool camping gadgets available to take on your next outdoor adventure — many of which won’t break the bank — it’s hard to resist a little bit of tech. From a pint-sized espresso machine to a straw that lets you drink water directly from a river, our list is comprised of cool camping gadgets to help you agonize less and spend more time enjoying the nature around you. And when you’re finished, take a gander at our guide on what you should pack in an outdoor emergency kit. After all, accidents do happen. If you and a friend accidentally split up during a hike, and don’t feel like playing Marco Polo for the next half hour, the GoTenna is for you. Once connected to a smartphone via Bluetooth, the device allows you and a companion to send texts or GPS coordinates to one another using a low-frequency radio wave network — that is, assuming you’re within three miles of each other (it works up to six miles in flat areas, and a mile in cities). The wands are sold in pairs and each lasts for several days on a single charge. Do keep in mind you can’t contact emergency services with it, unfortunately. Overall, the GoTenna is durable, affordable, and can be a lifesaver for anyone who likes to venture into the great outdoors on their own. Watch our full GoTenna review here. 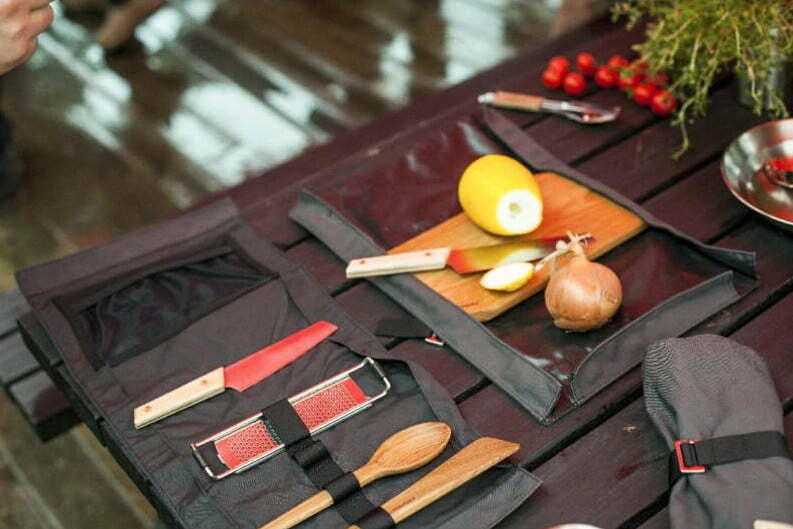 Made with a high-end polycotton carry pouch that rolls up into a compact space, this campfire prep set is the ultimate gadget for your camp kitchen. The five-piece set comes with a chic wooden spatula-fork-spoon trio, along with a stainless steel grater and a sharp campfire blade. Each utensil has its own custom loop and the case features a spare pocket for additional accessories. As a bonus, the knife slot features a magnetic back to hold it safely and securely in place. 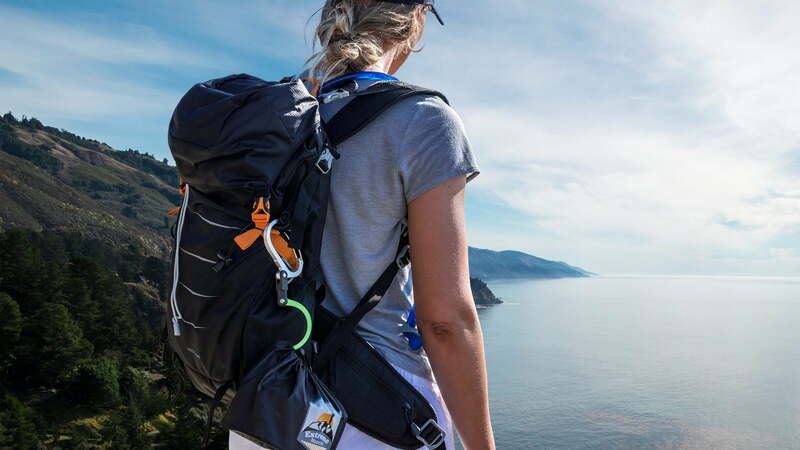 Venture Pal’s Daypack is the best of both worlds. Not only is this streamlined pack lightweight and durable enough to throw anything at it, it’s cheap price point makes it entirely too tempting to refuse. The pack holds up to 35 liters and when you’re done using it, it folds within itself, allowing you to save some extra shelf space. It isn’t waterproof but the Venture Pal Daypack is still ideal for people who enjoy light hikes and camping trips when the weather’s nice. If you’re in need of additional suggestions, we’ve also curated a list of the best backpacks for any outdoor outing. Incredibly convenient, this clever 3-in-1 gadget incorporates a clip, swivel, and hook all into one, allowing you to hang anything up to 50 pounds from virtually anywhere — a tree branch, backpack, hammock, camp chair, you name it. Its patented 360-degree swivel and double-jointed folding hook system lets you take advantage of awkwardly shaped natural features in the great outdoors . and it’s so light and portable, you can take it anywhere. The clip is constructed from sturdy aircraft grade aluminum and perfect for hanging lanterns, water filtration systems, bear-proof food bags, wet clothes, and other camping accessories. Like the name suggests, the Earth Pak Waterproof Dry Bag excels at keeping belongings dry during your next rafting or kayaking adventure. As an added bonus, the bag also comes with a waterproof phone case — one which event allows your phone to be submerged in up to 100 feet of water. The bag is also available in a range of sizes, and comes with a convenient shoulder strap. Earth Pak has seemingly thought of everything when it comes to making the perfect dry bag. The outdoors are great but they’re missing something terribly important: Coffee shops. Fortunately, Snow Peak recently launched a three-piece Field Barista Set that allows you to make Starbucks-quality java deep in the wilderness. The set includes a high-quality coffee drip, a grinder, and a chic stainless steel kettle, all of which nest inside each other into one compact space. The grinder is built with an adjustable ceramic burr and the cone-shaped drip allows a fine ground to percolate into the brew. 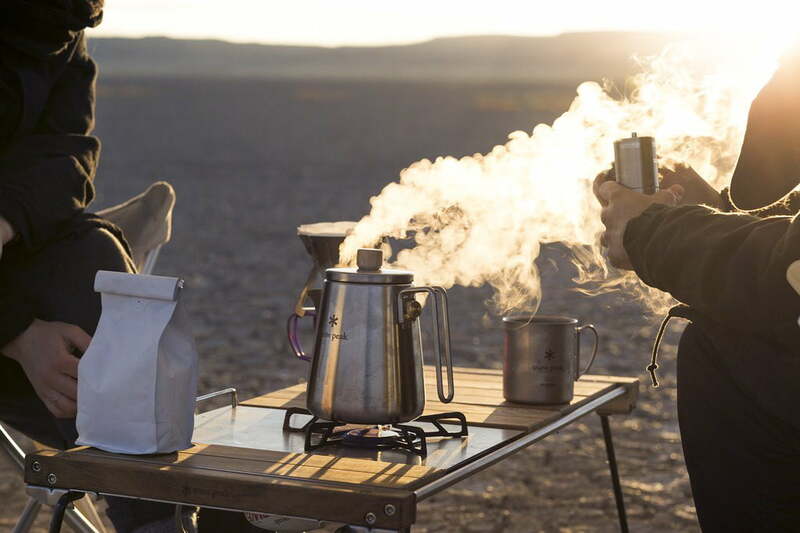 This portable coffee-making set is also a great addition at winter cabins or beach getaways. Note that the kettle, drip, and grinder are purchased separately. Like Superman, Anker’s lineup of solar panels harness the power of the sun to charge two of your devices simultaneously. Anker’s 21-watt offering provides an impressive 2.4 amps per port, however, it’s also the company’s most expensive model to date. The solar charger is incredibly portable and built to withstand mud and an occasional dusting. The device’s internal components render it too delicate to use in the rain but for the price, this is one of the best solar chargers you can take on your next camping trip. If you want a cheaper offering, Anker has other products which vary in price and wattage. Thermacell’s latest mosquito repeller is the perfect addition to make your campfire zone peaceful and bug-free. 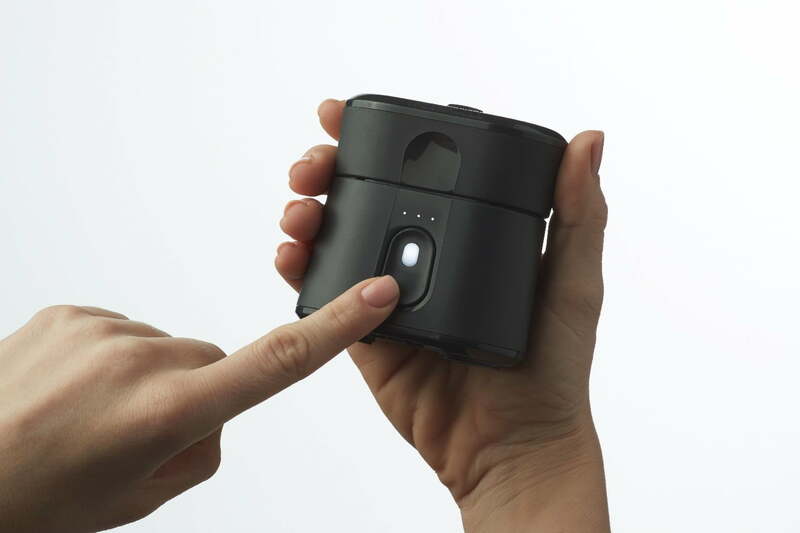 Unlike tiki torches, candles, or Deet-infused sprays — which tend to carry heavy odors and often irritate your skin — this silent, odor-free device keeps mosquitos away with the simple push of a button. Just give it a tap and it emits a protective barrier that lasts more than six hours and can be used at any elevation. The new Radius is different than its predecessors in that it uses a rechargeable battery to heat the liquid repellent instead of relying on the butane cartridges used in the older models. Each liquid cartridge is compact and offers up to 40 hours of continuous protection. With a couple pieces of kindling and a match, BioLite’s eco-friendly Campstove 2 allows you to cook food, boil water, and charge your smartphone on the trail. Once up and running, it boils a pot of water in less than five minutes — depending on the strength of your fire — and juices your phone with about an hour of talk time after 20 minutes of charging. The device is compatible with BioLite’s existing KettlePot and Portable Grill, too, and comes equipped with an LED dashboard that provides information on the amount of available power at any given moment. If your camping diet is nothing more than some hot dogs and s’mores — and you want to make the occasional phone call — then the Campstove 2’s added features make it worth the price of admission. Ever try to start a fire in the woods when it’s windy or rainy? It’s downright frustrating. Plus, trying to create a fire in an emergency in these conditions is less than ideal. 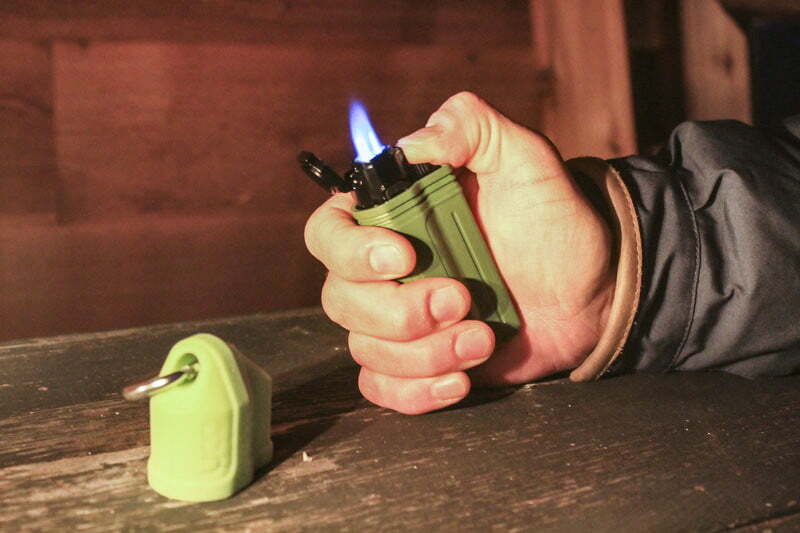 Thankfully, this brilliant lighter is one hundred percent stormproof, capable of being lit during the wettest, windiest, gnarliest conditions and staying lit until you blow it out. It features a triple jet with fully adjustable flame height and a waterproof case. There’s also a bottle opener on the bottom, making it the perfect multi-tool to throw in any camping bag. There’s nothing nicer than a warm shower after camping but why wait until after your trip? The Nemo Helio LX sports a six-gallon tank and a pumping mechanism, which nets you a shower experience no other portable shower offers. After stepping on the pump mechanism a few times, the shower provides up to 10 minutes of steady pressure and you can make the water warm by placing it in direct sunlight. Nemo also offers a cheaper option, though it features a smaller tank and lacks the nifty silicon sleeve that holds the nozzle in place. Just because you’re camping doesn’t mean you can’t enjoy a bit of luxury. 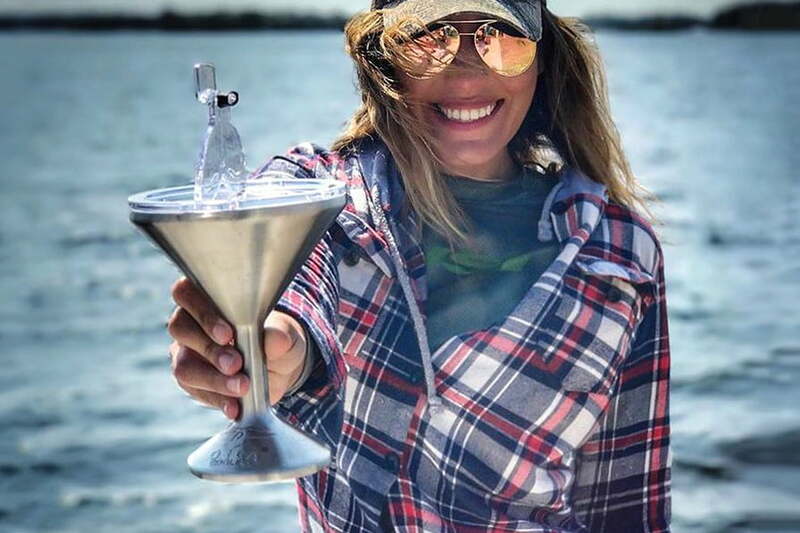 The Chasertini is a mega-durable, shatter-proof martini glass meant for camping and the outdoors. It features double-walled, vacuum sealed stainless steel that’s guarded to keep your adult beverage cold for hours on end no matter how far into the backcountry you venture. The lightweight, 8-ounces glass comes with a convenient flip-top lid and copper clad interior to regulate temperature. Perfect for picnics, tailgates, and outdoor concerts, too. The LifeStraw Personal Water Filter allows you to turn any swimming hole into your own, personal drinking fountain. The filter eradicates 99.99 percent of waterborne bacteria and parasites, and it filters up to 1,000 liters of contaminated water without the use of chemicals. The straw lets you turn any bottle of contaminated water into drinking water for a mere $20, and its portability makes it second to none. You’re probably good with any watch in Casio’s Pro Trek series but we’re a sucker for this particular model — namely because it hits the sweet spot when it comes to features and price. One of the watch’s coolest features is its Triple Sensor Engine, which provides you with directions, altitude readings, and weather forecasts. The device is powered via an unnoticeable solar panel located on the watch face and its frame is tough enough to endure temperatures as low as 14 degrees Fahrenheit and up to a 100 meters of water.